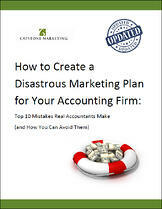 How a marketing plan can contribute to your firm's legacy. How to retain your top talent by acquiring profitable, challenging clients. How not to waste your marketing budget on low-value activities. How to generate leads from new and different marketing activities. What's really required to execute your plan. Fill out the form at the right to receive your complimentary copy today! Download our complimentary eBook today!